Want to accessorize your garden this summer? Consider featuring a unique water fountain handcrafted by you. The calming sound of the water will turn your backyard into a refreshing summer retreat. Water fountains are quite easy to create; in fact, your local nursery or home improvement store probably sells kits like this one. For water fountains there are three essential elements: the cycling water, the pump system, and the sculpture that contains the water (which can be anything from pots to rocks). You’ll need to be sure that the fountain is close to an outdoor outlet. And you’ll also need to make a stylistic decision: you can have the have the fountain sitting above ground or you can better secure the fountain by having it partially submerged in the ground. Not sure where to begin? Simply put your pump in a deep waterproof container. Then cover the container with mesh wire, which keeps debris from collecting in the water. Then run the piping through your sculpture and secure it within your piece. When the pipe is secure and the water fountain is filled, try plugging in the fountain to an outdoor outlet in order to see it in action. Lastly, remember that most pumps have settings that will allow you to control the water flow from a strong spray to a soft ripple. This relaxing water feature is rather simple and makes a great weekend project for an avid gardener. Need some unique inspiration for your water fountain? Reuse garden supplies. Some of the most inventive water fountains are those that are made from old garden supplies like watering cans, pots and washtubs. Not only will you get some use from the old plant pots you never use, but you’ll also be “upcycling” and helping to save the planet at the same time. Recycle kitchen containers. Think beyond your tool shed and consider making a water fountain with materials from your kitchen. How about a teapot water fountain? Or a fountain made from stacked teacups or recycled wine bottles? 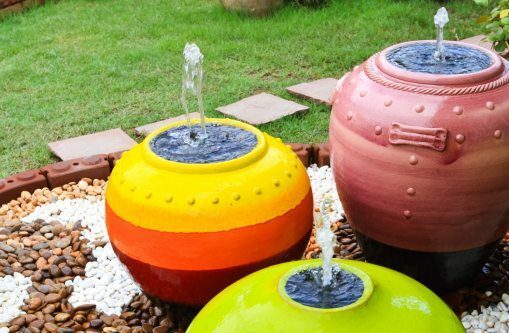 Your unique water fountain will definitely be a conversation starter at your next garden party. Seashells. Want to have a little piece of the beach in your own backyard? Consider making a mini fountain from seashells. Don’t have enough seashells? Consider using your kids’ old sand pails and shovels instead. Solar powered water fountain. Don’t have access to an outdoor outlet? Want to conserve electricity? Buy a solar powered water fountain kit instead. It consists of the same pump and tubes, but it’s all powered by the sun. You can find an example here.